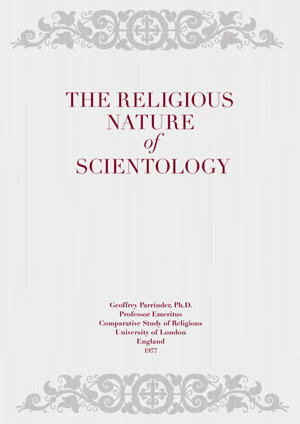 The Religious Nature of Scientology - Geoffrey Parrinder, Ph.D.
Geoffrey Parrinder, Ph.D., (1910–2005) was professor of the comparative study of religions at King’s College, London, where the future Bishop Desmond Tutu numbered among his early students. For nearly two decades he worked as a Christian missionary in Benin and Côte d'Ivoire, during which time he became an authority on indigenous West African religions. He was also world-renowned for his expertise on Hinduism. Dr. Parrinder authored the bestseller What World Religions Teach Us (1968). This was one of his over thirty books in the field of religion that also included West African Religion (1949); The Story of Ketu (1956); Man and His Gods (1971); A Dictionary of Non-Christian Religions (1973); Avatar and Incarnation: A Comparison of Indian and Christian Beliefs (1970); The Bhagavad Gita: A Verse Translation (1974); and Sexual Morality in the World Religions (2003). He served in numerous professional academic societies and was a founding member of the British Association for the Study of Religion (BASR).